The guilt-free alternative to your favourite pasta dish! Our Avocado Pesto Courgetti will satisfy that noodle craving while packing a healthy punch. With our Ripened Avocado Halves serving as the delicious base to the pesto, you won’t compromise on flavour. Save time by buying pre-spiralised courgettes from the supermarket, or do it yourself with your own spiraliser! Let the Ripened Avocado Halves defrost as per pack instructions. Blend the walnuts, avocado, lemon juice, garlic, basil, salt and pepper. Add the olive oil and blend again. Taste and add more seasoning if needs be. 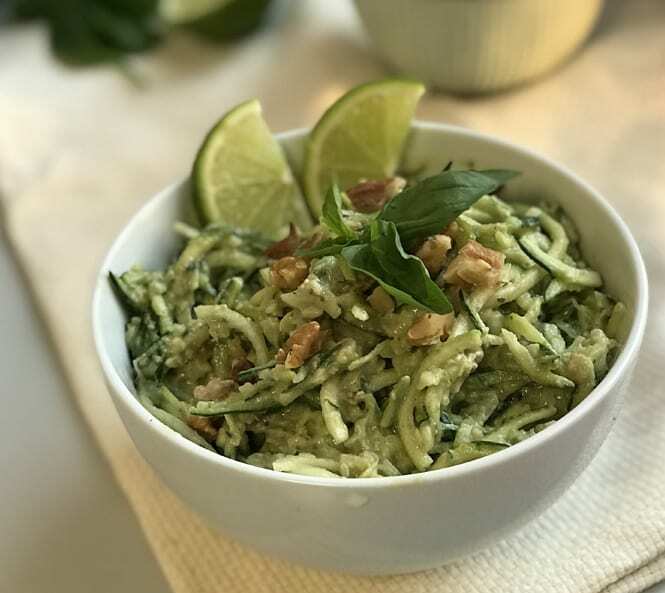 It is possible to purchase pre-spiralized courgette, alternatively, it is very easy to make at home with a spiralizer. Heat the courgetti in a bowl of water until al dente. Drain the courgetti. Mix the pesto into the courgette and serve.